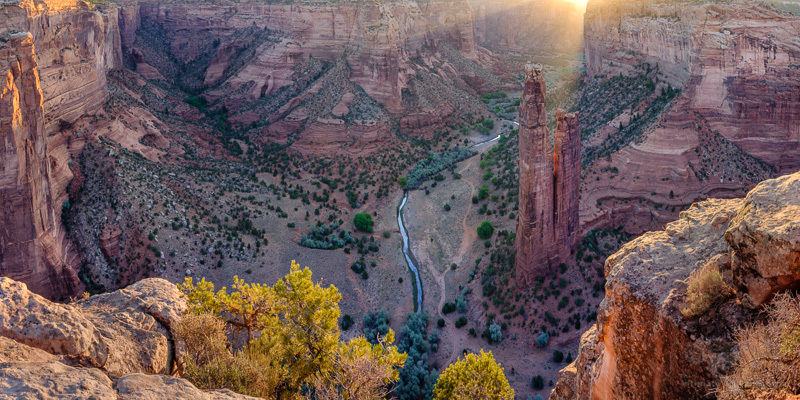 Probably the most famous feature in Canyon de Chelly is Spider Rock, two sandstone towers that stand out at the dividing point of two canyon branches. The tallest tower is 750 feet tall and is the home of the Spider Grandmother, an important figure in Navajo mythology. It’s very easy to get to Spider Rock overlook – just a short walk along a carefully crafted and maintained walkway from the parking lot. There are an abundance of interesting viewpoints along the walk, with plenty of trees and rocks to create interesting foreground framing. To create this image, I arrived about 20 minutes before sunrise and made my way down the path to the viewing area. Using an app on my phone called PhotoPills, I was able to determine where the sun would rise over the canyon and I walked back and forth along the trail to find the right composition that put the sun in the right position. I hoped that the rising sun would cast shadows from the rim of the distant side canyon behind Spider Rock and my planning paid off. This image is not a crop of a single image to create the 2:1 aspect ratio: I shot a series of 7 vertical images with the Fuji GFX camera and the Fuji 45mm f/2.8 lens from left to right in a single row to create the panorama. I had time before the sunrise to work out where to start and end the sequence of images to place Spider Rock on the right 1/3rd of the image, and to frame the scene with the canyon walls on the left and the rocks and trees along the bottom. The stream bisecting the image is reflecting the blue sky above, in contrast to the warm tones of the canyon walls. The nearly-vertical section of the stream in the middle of this two-dimensional image parallels the vertical nature of Spider Rock itself, when, in three-dimensional reality, they are perpendicular to each other. The exposure for each of the 7 images used to create this composite was 1.3 seconds @ f/29, ISO 100. This entry was posted in Southwest, technique and tagged Arizona, Canyon de Chelly, desert, landscape, rock, Sandstone, southwest, Spider Rock.